Posted in: Education, Kismet, Tutorial, UDK / Unreal 3. 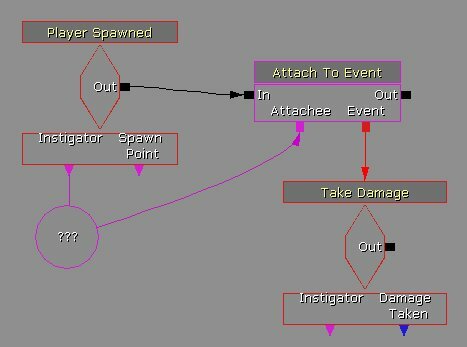 While working with UDK (Unreal 3) and Kismet, I came up with some solutions to issues I found which are simpler and neater than the “commonly offered” solutions, purely in Kismet visual scripting. The following is a health regeneration system which is both relatively simple, works smoothly and has a delay in starting health regeneration after taking damage. First, we need to know when we’ve taken damage, and hence should not be regenerating health in the first place! We can now detect when the player has been damaged – every time he does so, “Take Damage” will now fire. With that done, we need to now set up the system will will use for delaying regeneration based on damage taken, and this will be done by declaring a boolean variable, “Taken Damage”, and set up a delay in regenerating health. Name the Bool’s (variable) as “TakenDamage”, and leave it as false – this declares the Boolean name. We now want to add two instances of checks on this which you can do via – New Variable / Named Variables in Persistent Level / TakenDamage. For each of the Bool (variable)’s, right click on “value”, then “Create New Bool Variable”. Change one of those to False. Let’s examine this – again, when the player takes damage it triggers “take damage”. This uses the first Bool (variable) to set “TakenDamage” to “True”. It also stops the timer delay. 0.1s later, the timer is now restarted (To create the delay, right click on the “out” node and select “Set Activation Delay”). If the Delay is allowed to finish – by not taking damage for those five seconds – the second bool is now triggered, and “TakenDamage” is now set as “False”. Now we have set up a system to tell us when we should be regenerating health, let’s make that happen. The Modify Health needs to have it’s Amount set to 5 and “Heal” checked. We begin the logic looping when the player is spawned. We check with the Compare Bool to see if “TakenDamage” is false, if it is then we add 1 to the Player’s health with the Modify Health. Regardless if it is true or false, we trigger a delay of 1 second after which the Compare Bool is checked again, etc. This now works! You can use other values – a shorter delay and a smaller heal amount, for instance, to create a smoother regeneration, if you wish. …We then have a trigger which damages the player when we trigger it, and which we can use to test the health regeneration!